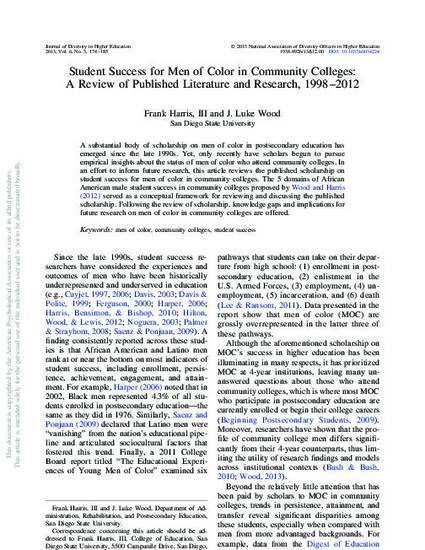 A substantial body of scholarship on men of color in postsecondary education has emerged since the late 1990s. Yet, only recently have scholars begun to pursue empirical insights about the status of men of color who attend community colleges. In an effort to inform future research, this article reviews the published scholarship on student success for men of color in community colleges. The 5 domains of African American male student success in community colleges proposed by Wood and Harris (2012) served as a conceptual framework for reviewing and discussing the published scholarship. Following the review of scholarship, knowledge gaps and implications for future research on men of color in community colleges are offered.